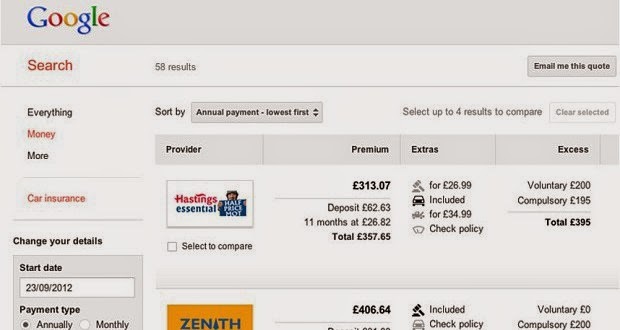 One of the many help users in Europe Google services purchased insurance policies since 2012, particularly in the automotive, travel, mortgage insurance, but recently emerged new evidence that Google plans to start selling insurance policies in the United States as well. According to a new report published by the Wall Street Journal about the analyst Ellen Carney of the company Forrester who was briefed on Google Compare a company distribution policies auto insurance company and it seems that it is planning to start a business in America this year. According to the analyst, there is a new subsidiary of Google called Google Compare Car Services Insurance has obtained the necessary licenses to sell insurance policies in 26 US states and also can on behalf of the sale policyholders for six major insurance companies and so on behalf of the insurance broker Cardhound what had paid later to acquire them so. Users in Europe and tends more to use compared to the prices of insurance policies online services - a Matkdmh Google - most of them in America, and ask the American laws of any site that wants to display the prices of insurance policies for the same coverage and compare them to each of the various other companies that holds a license to sell insurance users, and here you want Google to put a foothold for itself through the use of technology in research and organize information and compared in real-time. So far Google has not confirmed this news and reported a company spokeswoman they get attached to the speculation, and we still have to wait from Google to enter into this new market to provide users of the search engine has a new way to get the best insurance policy for them.